Definition: In most countries the Bar refers to the legal profession as a whole, whereas in the UK it only includes barristers, not solicitors. The ‘Bar’ is used because it refers to an imaginary barrier in court that separates the participants in the trial from the spectators. In the UK the term ‘to be called to the Bar’ means to be admitted to the profession of a barrister by one of the Inns of Court. 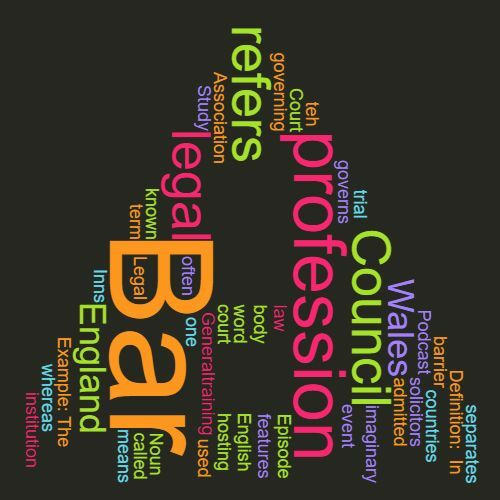 The governing body for the legal profession is often known as the Bar Association, in England and Wales the Bar Council only governs barristers. Example: The Bar Council is hosting a training event for barristers. This word features in Episode 41 of the Study Legal English Podcast. Dmitry’s Tips: Why you should use your hobby to Study Legal English	What is Study Legal English doing to be GDPR compliant?